The premise is that we can find at the center of a novel’s manuscript a scene that defines what the story is all about. And within that scene there is often a particular moment that brings theme, plot, and character into focus, sometimes as bright and faceted as a diamond. Bell calls it a “look in the mirror moment.” His examples help explain what he means, and they are convincing. It is this center moment that, during revision, a writer can rewrite towards or away from, before and after. It is a fulcrum point, the center nougat of the candy. Which is why Bell’s book is of considerable value to a novelist stuck in the throes of a long revision, unable to fix the path from page one to The End. Bell’s little secret finds the heart, if indeed it’s there. I don’t imagine any author consciously produces a mid-point that represents his entire book. It just happens. Bell uses the term magic. I was surprised as hell to find the middle moment in my own comparatively unstructured draft. I divided the page count by two and there it was, obvious and lucid – my book’s thematic moment. Not perfect and absolute but pretty damn close. This was inspiring to say the least, as some sort of wizardry affirmation that my book does have a heart. This discovery has been very helpful in the surrounding revisions before and after that point. For this magic trick, I’d buy Mr. Bell a drink if I ever ran into him. 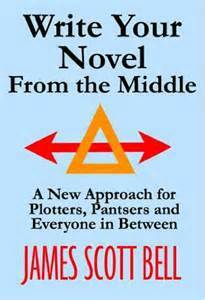 Posted in Writers' Corner and tagged review James Scott Bell "Write from the Middle" on February 28, 2015 by Wm P.